Kids' Book Review is delighted to welcome Australian author Tony Davis. 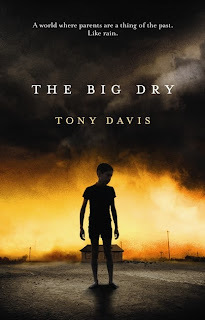 Tony's latest book, The Big Dry, is a middle fiction/young adult adventure story with a psychological thriller twist. Your writing career encompasses a range of genres and writing styles. What do you find particularly appealing about writing for teenagers? I guess I’ve been working my way towards teenagers – my children’s books have been getting “older” as my own children have been doing likewise. I’m now up to the “tween” stage. That’s nominally 10 to 14 years old, though I’m hearing some of the more traditional YA audience are also reading The Big Dry. I suspect that’s because there is a very strong, intriguing older character in the plot (though that wasn’t my motivation for having her there!). I have hugely enjoyed writing for the upper primary age and hope to do more of it, but there are obvious restrictions. With “tween” writing I can use more expansive language and explore far more complex themes, so in that sense it’s closer to the writing for adults that I do (and love). It is interesting too because with these older readers, you can have a more detailed discussion afterwards about how they have interpreted what was within the pages. Is it difficult to engage teen readers with ‘big’ issues through fiction? How do you make these issues interesting to young adult readers? Absolutely. Most of them won’t eat greens and they treat preachy “big issue” books in much the same way. Fortunately I didn’t set out to write a polemic of any type. I chose the background because such a scenario fascinated me, and to heighten the tension between the characters. A good novel, I believe, has to be first and foremost about people meeting challenges, but it also needs to be set in a thoroughly believable world, and I worked hard at creating that world, and in making the dust storms both frightening and visceral. A lot of the children’s writing that I have done in the past has been humorous. The Big Dry is primarily an adventure story and, in a sense, a psychological thriller as young, inexperienced characters try to work out what they should do, and who they can trust, in a world where a slip-up can be fatal. Of course it is difficult for the reader not to think about certain issues along the way, including the endless drought, the painful flow of people from one place to the next in search of food and shelter, and what is acceptable and what is not, morally, for a scared 13-year-old trying to protect his younger brother in such a dangerous environment. The Big Dry has only three significant central characters who are isolated in many ways. How do you engage your audience throughout the novel within these limitations? I wanted those limitations. I wanted a claustrophobic atmosphere, both physically and emotionally. That way, if you didn’t trust someone, you’d cut down your options, indeed your whole world, by a very great amount. And if you did put your faith in a person, the risks were so much higher because there was almost no one else to turn to if it proved to be a bad decision. Most importantly, I knew with only three characters, they had to be thoroughly rounded and engaging. The Big Dry’s success as a novel would rise or fall with how engaging those characters were. How important do you think it is for Australian teens to have access to books set in Australia? Very. My book doesn’t mention counties or cities by name, but there is much within it that identifies the setting as a large Australian city. The plot hinges on one of our great national concerns – what happens if we run out of fresh water? At the risk of getting all political, if we allow our industry to become a branch of Amazon.com, any books that are set in Australia will likely be set not in an authentic Australia but one packaged to appeal to American audiences. How does literary fiction differ from general fiction? Why is it important to offer this genre to teen readers? I read all types of fiction growing up, and they all have their place. The literary tween novel is a pretty rare thing and I delighted in the challenge of balancing what I hoped would be a fast moving, absorbing plot with a very carefully styled text that pushed young readers to consider some weighty issues. Literary fiction is important to young readers because it provides a bridge to quality grown-up fiction. Many adults are now reading and enjoying fiction written for tweens and teens. Do you write with an older audience in mind, or do you concentrate on younger readers alone? It was Auden who said “there are no good books that are only for children” and it’s hard to disagree. These days I can read, say, a classic Ivan Southall novel and be thoroughly entranced on two levels: in sheer admiration of his technical skill and the warmth of his writing, but also in the process of winding back the years and remembering what it was like to be a teenager reading the sort of books that really helped shape your life. When I am writing for tweens there are obviously some subjects that are off-limits, and if I use a difficult word I will always make sure the context helps explain the word. However, I am never consciously limiting the levels of meaning, or the richness of the writing. I hope there are enough layers for any reader of any age, for example, in the fears and motivations driving George, the naïve 13-year-old, and those of Emily, the older, streetwise girl, and I hope that these are reflected in the twists and turns of their combative relationship. The Big Dry was published by HarperCollins Publishers in July 2013. Read our review here. You can also watch Tony discuss The Big Dry in this video for the HarperCollins' Teachers' Hub. A man who doesn't dumb things down for kids. A writer after my own heart.